Event organizers create unforgettable events that are rich of content for the participants of their event. Following the motto "Do good and talk about it" these events are promoted best by a liveblog. Main goal of a liveblog can be either a positive branding effect, the generation of leads, or the monetization through partners and sponsors. 1. What is a liveblog? A liveblog is a marketing tool for you, to cover your event live and to use it as a presentation in your external communications. A liveblog combines the most important statements of speakers with photos, videos and social media posts. Thus, a multimedia documentary of your event is created, and your costumers can keep track of it at home or while working, similar to a sports liveticker - just much better and with your messages. 2. Who will I reach with my liveblog? With a liveblog you will reach prospective participants for your next event. With high-value content in real-time you have the perfect base to win new participants organically. Your speaker - if every speaker shares his or her contribution which you have covered in the liveblog with his or her community, you will reach new people with your event. 3. Which marketing goals can I achieve with my liveblog? Do you want to generate a positive branding effect for you corporation or do you want to generate leads? Big events with several thousand participants normally focus on the branding effect. Thus, the event can present itself as innovative. Symposia, on the other side, concentrate on the generation of new leads, to sell more tickets for their event in the following year. 2. The production of content on site, e.g. a short video with the particular partner or photos from their booth. 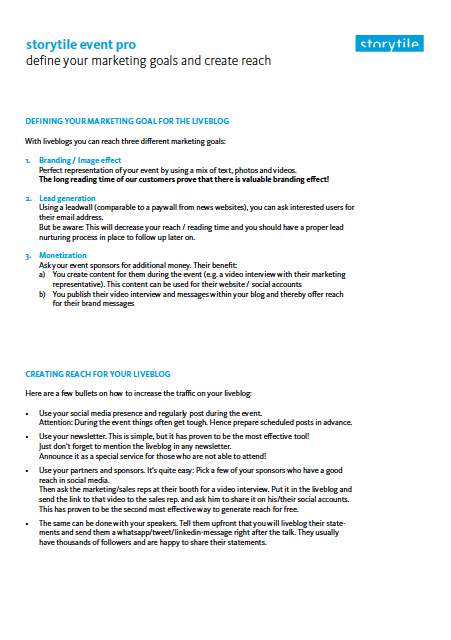 Our liveblogging suite offers tools for all these marketing goals. In addition to that we also support you as an agency with our expertise and manpower. 4. Do it yourself - or having it done? With our liveblogging suite you can liveblog completely on your own from your event. You want to have a liveblog but don't have the manpower? No problem: We also offer full service packages as an alternative. With our liveblogging suite you can blog your event on your own or with a team. The software allows you to collaborate with your colleagues and even has a innovative way to wirelessly receive photos from your photographers. You can test storytile with your free demo account and decide later if you think it's worth to pay for a regular license. High qualified and continuously trained live-editors and live-photographers provided by storytile will blog your event live in a professional way. The team of storytile will create an event roadmap together with your input. Our team can also collaborate with your own photographers and colleagues. They will also be trained and equipped by storytile.